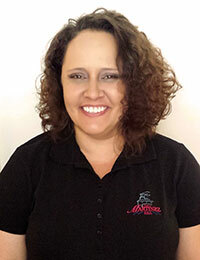 Kim, Dr. Martinez’s Registered Dental Hygienist, grew up in Downey, where she attended Warren High School. At 16, she began working for Vons Market in Paramount, where she enjoyed interacting with so much of the community on a daily basis for 9 years. After high school, she attended Cerritos College part time. Winning a scholarship through the Retail Clerks Union pushed Kim to attend college full time, and in 1997 she graduated from the Dental Hygiene Program. In 2002, Kim came back to Paramount to work for Dr. Martinez (who coincidentally is neighbors with Vons Market). Much to her delight, she would be interacting with the same community as with her first job. Only now, she would have a hands-on role in maintaining the oral, and overall, health of the same great community. Her patients benefit from her caring personality and her thoroughness (often being the first one in the office in the morning to review her patients’ charts), which assures each patient the best care. In her spare time, Kim enjoys caring for her furry brood. She and her boyfriend Andrew have an assortment of cats and dogs, all of whom are very spoiled. They also enjoy music and have taken a few vacations based on a concert’s location.